Many people are choosing to become a medical transcriptionist because the profession allows them work independently. Since medical transcription is a growing part of the medical industry, a medical transcriptionist currently in high demand. This demand will continue to increase because health insurance companies are not ready to process payments without checking medical transcripts. As a consequence, doctors and surgeons are continuously looking for efficient medical transcriptionists. Undoubtedly, this is a very opportune time to become a medical transcriptionist. Moreover, the most attractive benefit of the medical transcription profession is its entrepreneurial prospect. Once you have received medical transcriptionist training and gained experience in the field, you can easily set up a medical transcription business. Low start-up costs and flexible working hours make it all the more lucrative. In this post, you will discover the steps to become a medical transcriptionist and start your own medical transcription business. Gaining a clear understanding of this profession will help you become a medical transcriptionist. As a medical transcriptionist, you will be transcribing information from the physician’s dictations. Most of the time, medical transcriptionists create detailed reports and administrative documents using dictated recordings. You may receive the dictations over phone or listen to prerecorded dictations. In addition to transcribing, medical transcriptionists edit medical information, correcting grammatical mistakes and adding correct medical terms in appropriate places. To be successful as a medical transcriptionist and start a medical transcription business thereafter, you must be proficient with medical terminology in addition to believing in the power of positivity. More specifically, you should have a working knowledge of information pertaining to anatomy, surgeries, medical procedures and treatments. Plus, you have to learn how to be detail oriented. Understanding the responsibilities of a medical transcriptionist can help you make the start up healthcare business choice. To become a successful medical transcriptionist, completing a medical transcription training program is necessary. You will not have to attend any business colleges, just a vocational school. There are a number of vocational schools, online schools and community colleges that offer medical transcriptionist training. Furthermore, medical transcription training that are accredited by Approval Committee for Certificate Programs or ACCP are the most credible among them. When deciding, you can choose either a diploma or an associate’s degree program. Depending on the program you select, the course term will range between 6 months and 2 years. Most medical transcriptionist training programs will require you to finish GED or high school diploma. The subjects included in the training are English composition and grammar, computer applications, medical terminology, pathology, anatomy, physiology and medical transcription skills. While medical transcription training is not mandatory to work as a medical transcriptionist, it definitely increases your chances of getting more clients. Whether you choose to freelance or start a medical transcription business, professional training can help you get ahead. Just like professional medical transcriptionist training, certification is also optional. However, to succeed in this field, getting certification is highly recommended. Medical transcriptionists may obtain the Registered Medical Transcriptionist Certification granted by Association for Health Documentation Integrity or AHDI. But, first, you have to pass the AHDI organized national level medical transcriptionist exam to become a Certified Medical Transcriptionist. Then, as a Certified Medical Transcriptionist, you can renew their certification by earning further educational credits. Hands on experience will advance your efforts to become a medical transcriptionist. To gain experience, you can apply for medical transcription internships during the training program. Additionally, you may gain experience by working in an established medical transcription business after completing the training. Gathering experience not only increases your efficiency but also offers insight about running a medical transcription company. Once you have become a medical transcriptionist, you may start a medical transcription business. A medical healthcare business is rewarding in terms of freedom, flexibility, job satisfaction and revenues. The equipment you will need include computer, laser printer, backup, English dictionary and transcription styling software. On top of that, you will want to have a foot pedal, headphones and secure internet connection. Factoring in all the equipment, the total cost of starting a medical transcriptionist business will be around $6,000 to $10,000. With the proper training, equipment and financing, you are ready to start your medical transcription business. Get a real office location for your business. Make sure it is separate from your home. This will help make potential clients much more comfortable. They will be more likely to do business with you if they know that your business is legitimate, credible and reliable. Having a business location provides business validation. It establishes that credibility and legitimacy right away. Start a transcriptionist business that has an actual location outside of your own home. You are much more likely to attract leads that way. 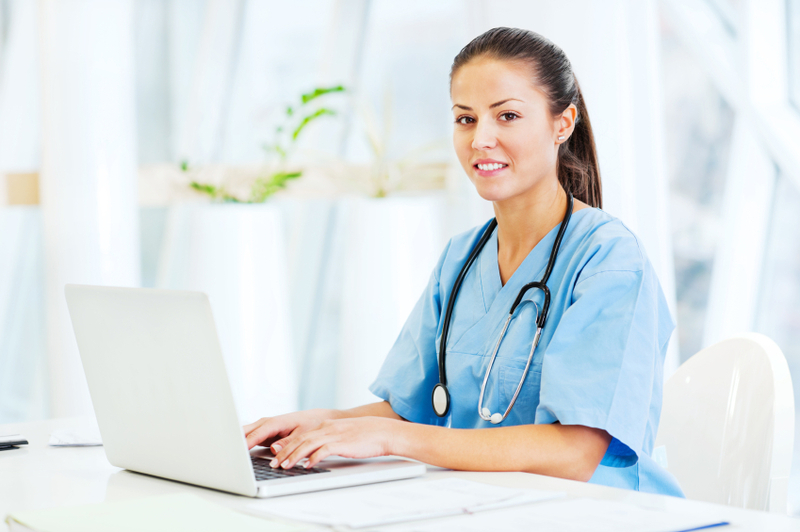 Once you start a medical transcription business, find a specialization that works for you. While most hospitals and healthcare clinics need transcriptionists, many surgical centers also need these services. They train their staff on how to become a surgical nurse. And, for each interaction they have with patients, they require transcription. The patient reports include diagnostics, diagnoses and procedures performed. All of these surgical reports require additional specialization that could help your new business thrive. Unfortunately for medical transcriptionists, there is a downward trend expected for the career outlook in general medical offices. However, this can still be good news for you. If you are really passionate about the medical transcription field, this career outlook will deter other, less passionate, job pursuers. It is also gives you a chance to really hone your interviewing skills, as well. If you really want to become a medical transcriber, do not let the less-than-stellar job outlook deter you from your passion. A world of opportunities can unfold if you become a medical transcriptionist business owner. You can work independently by starting your own medical transcription business. Or, you can work with a team by hiring your own staff. As hospitals, clinics, psychologists, doctors and malpractice attorneys all need medical transcription services, it is very possible to get work consistently and be successful without the large startup investment required to become a real estate developer.